The Santo Stefano Rotondo is located on the summit of the Caelian hill, just opposite the Santa Maria in Domnica, but somewhat hidden behind a wall and trees (see the last image of this post). 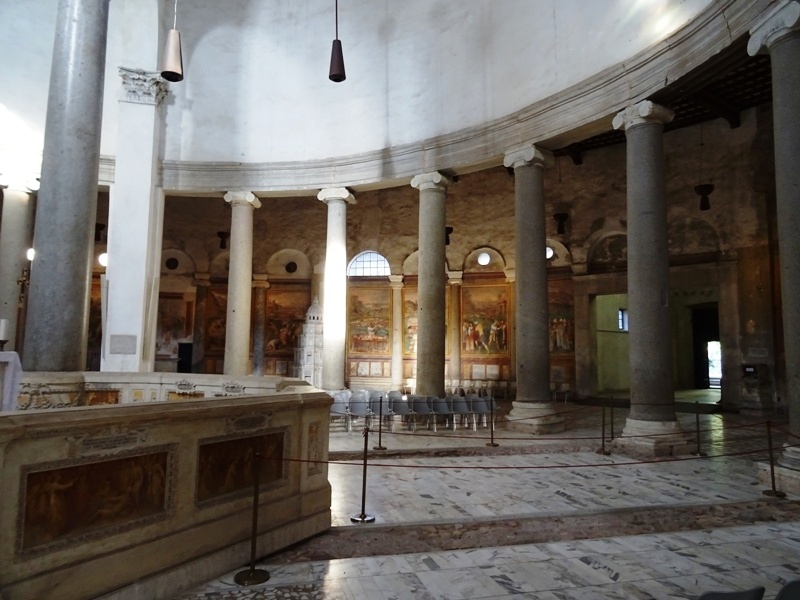 The church was built in the fifth century and it is the oldest surviving church in Rome that was built on a circular plan (the Pantheon is older, but it was not conceived as a church). The Santo Stefano is dedicated to Saint Stephen, Στέφανος in Greek, who is usually called the protomartyr, the first martyr of the new Christian religion. He is mentioned in the Acts of the Apostles as a member of the small Jewish-Christian community in Jerusalem and as “a man full of faith and of the Holy Ghost” (Acts 6:5). He was accused of blasphemy by some Jews frequenting a local synagogue, “For we have heard him say, that this Jesus of Nazareth shall destroy this place, and shall change the customs which Moses delivered us” (Acts 6:14). Stephen was taken prisoner and brought before the Sanhedrin, the Jewish court of law. Stephen’s defence speech caused even more outrage, and he was driven out of the city to be stoned to death. The future apostle Paul – then a Pharisee intent on persecuting Christians and still calling himself Saul – was a witness to Stephen’s death by stoning, and according to Acts 8:1 “Saul was consenting unto his death”. A stain on Paul’s reputation, but of course this was before his epiphany on the way to Damascus (described in Acts 9). “And devout men carried Stephen to his burial, and made great lamentation over him”, according to Acts 8:2. Later tradition states that the burial took place at Kfar Gamla, where nowadays the Beit Jimal monastery, west of Jerusalem, is located. Stephen’s remains were discovered in 415 and some of them may or may not have been translated to Rome, to be placed in a church dedicated to Saint Stephen. This church was the Santo Stefano, but whether any relics ever arrived there is uncertain and there is no direct evidence. 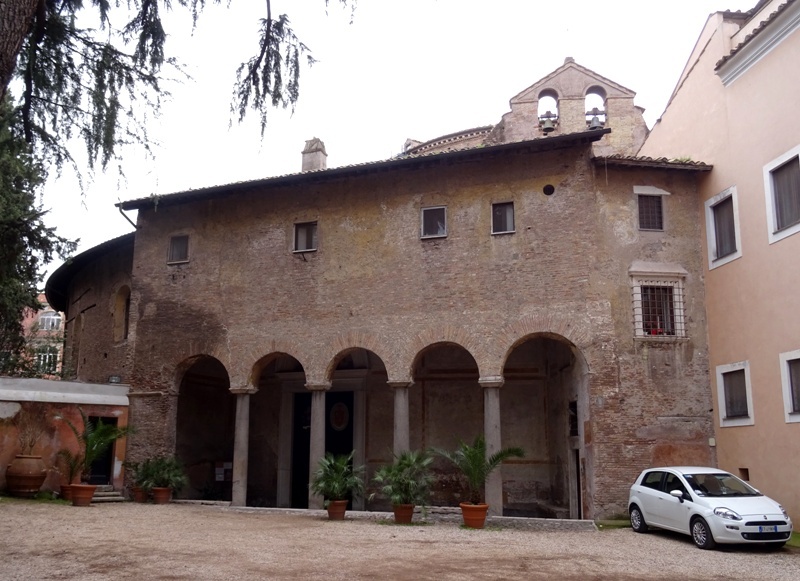 In any case, the Santo Stefano was consecrated during the pontificate of pope Simplicius, who was pope from 468 to 483. Construction of the church must have begun earlier, during the pontificate of Leo the Great (440-461) and the reign of the emperor Libius Severus (461-465). First ring of columns, with the outer wall behind them. The Santo Stefano was built on the Caelian Hill. In those days, one could find a residential area here, with insulae (apartment blocks) for poor and ordinary Romans and luxury houses for Rome’s nobility (cf. Santi Giovanni e Paolo). But there was also a military presence on the hill. The Fifth Cohort of Vigiles, the paramilitary town watch, had their barracks here (cf. Santa Maria in Domnica) and the Caelius was also the site of the so-called Castra Peregrina. The word ‘peregrinus’ means ‘stranger’ in Latin, and this was the name given to soldiers detached from their units in the provinces that were sent to Rome for special duties. The peregrini formed the emperor’s secret police and could be used by him or by their overall commanders, the praetorian prefects, to do some of the emperor’s dirty work. Units of peregrini seem to have been commanded by a princeps peregrinorum. Units of frumentarii were also stationed at the Castra Peregrina. Their name suggests they were originally responsible for the city’s grain supply and soldiers in the provinces who were responsible for foraging were also called frumentarii. However, either during the reign of Trajanus (98-117) or during that of his successor Hadrianus (117-138) the frumentarii in Rome became couriers, spies and occasional assassins. Relief showing Mithras killing the sacred bull (Museo Nazionale Romano, Rome). The Castra Peregrina was ultimately abandoned and handed over to the Church in the fifth century. A church dedicated to Saint Stephen was then built over the barracks. 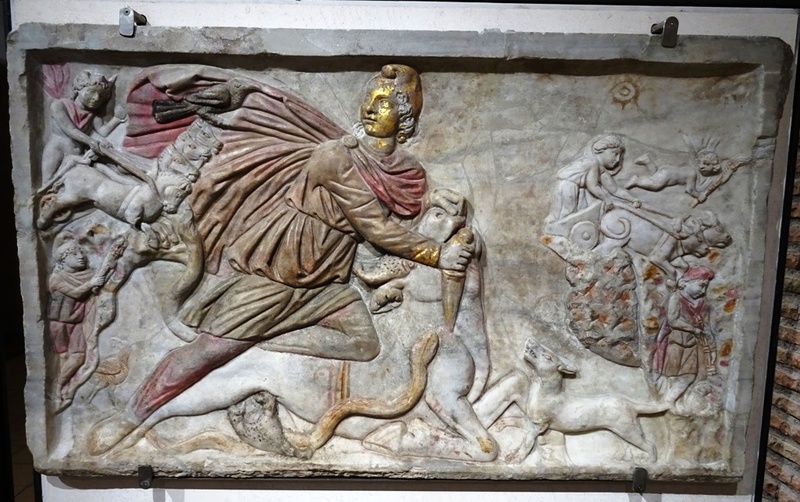 Excavations in the twentieth century have revealed that there is a Mithraeum beneath the Santo Stefano, a shrine dedicated to the light god Mithras (often mistaken as the source for Christmas). This is hardly surprising, as the secretive cult of Mithras was very popular among soldiers. Unfortunately, the Mithraeum is currently closed to the public. However, the large third century relief that was discovered there was moved to the Museo Nazionale Romano, and can nowadays be seen at the Baths of Diocletianus location. The relief shows the traditional tauroctony: Mithras is in the centre, killing a sacred bull in a cave. He is holding the animal by the nostrils with his left hand while stabbing it or cutting its throat with his right hand. Mithras is aided by several animals: a dog, a snake, a scorpion and – in this case – two ravens. Mithras is looking over his shoulder to the sky, where we see the sun god Sol in his four-horse chariot. In the top right corner is Luna, the moon goddess. Her two-wheeled chariot is apparently pulled by two more bulls. Next to her is a small naked boy, perhaps an eros. There are two more figures in the scene and both are dressed just like Mithras, in Anatolian robes and wearing the Phrygian cap. They are Mithras’ torch bearers, Cautes and Cautopates, with the former holding his torch up and the latter pointing it downwards. What is quite special about the relief is that some of its original colours have been preserved. Mithras seems to have had a golden face. The chapel of Saints Primus and Felicianus. I refer to the excellent Churches of Rome Wiki for a detailed analysis of the church’s complicated architectural plan and original form. 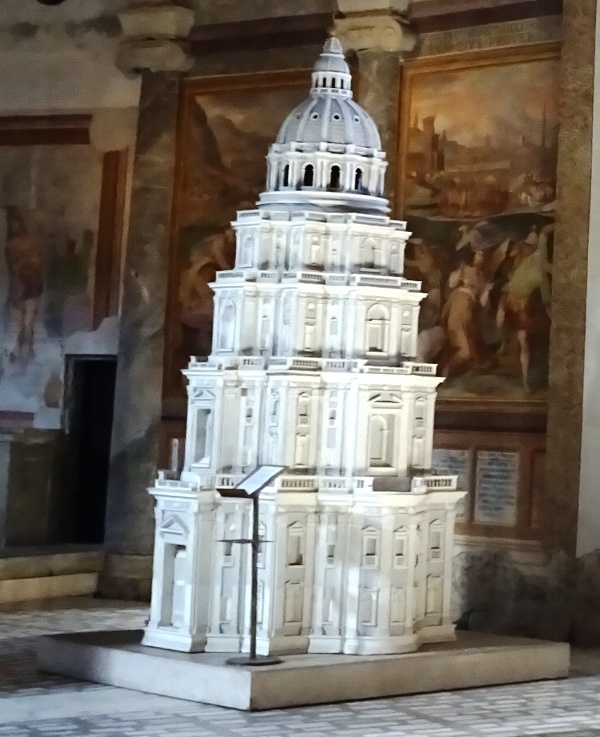 I will just note that the Santo Stefano Rotondo, like so many other churches in Rome and other cities, has been restored and altered on many occasions. 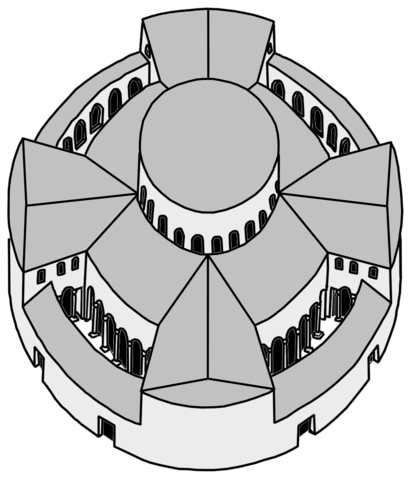 No one really knows why the church was built on a circular plan. 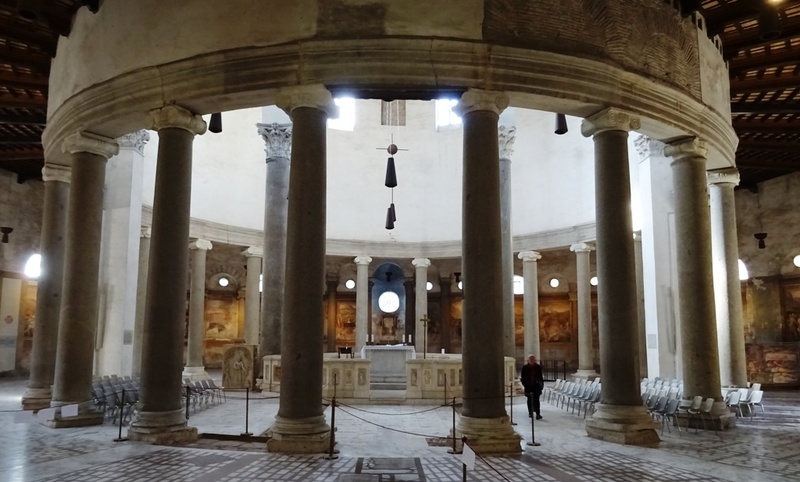 It may have been based on the rotunda of the Church of the Holy Sepulchre in Jerusalem, but we have no proof (see this post and this one for other examples of circular churches). 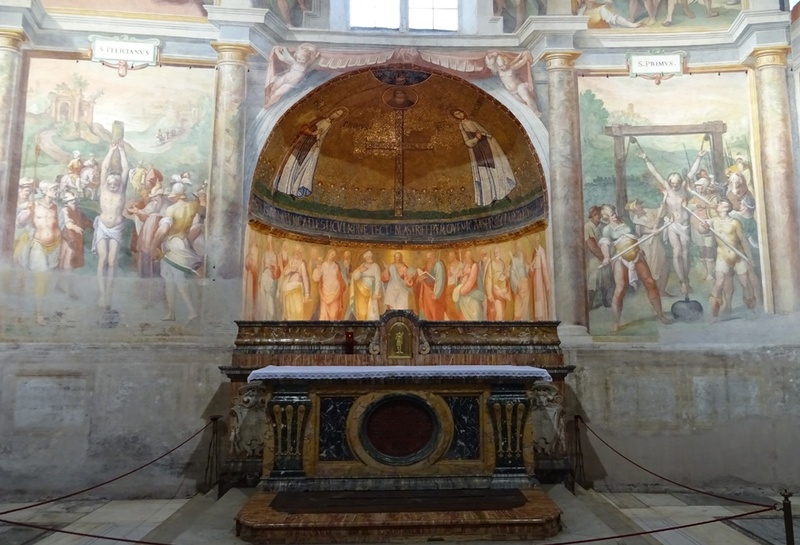 The church has a seventh century chapel dedicated to the Saints Primus and Felicianus. It was built during the pontificate of pope Theodorus I (642-649). Tradition holds that Primus and Felicianus were two brothers who were martyred during the persecutions ordered by the emperor Diocletianus (284-305). 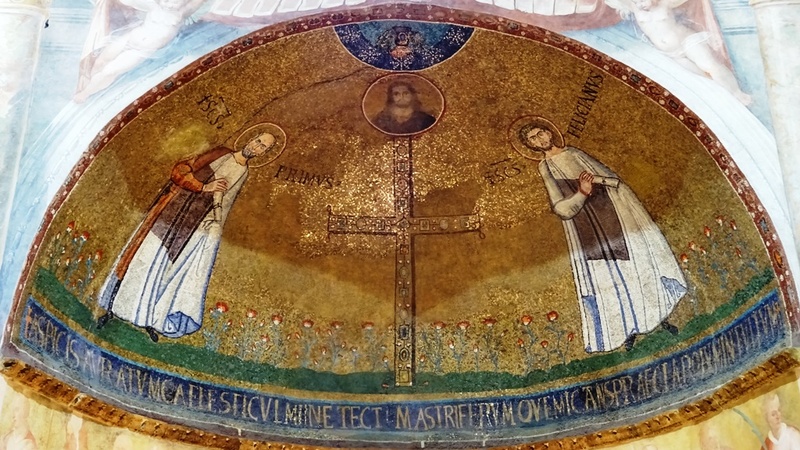 They were buried at the fourteenth milestone on the Via Nomentana and pope Theodorus I had their remains brought to Rome to be interred in the Santo Stefano. Why exactly the pope chose these two brothers is unknown, but it could be that the basilica built over their graves was demolished at that time. The brothers can be seen in the apse of their chapel, in a mosaic that shows a cross in the centre and the two brothers on either side. An image of Christ is above the cross. This is a rare example of a seventh century mosaic in Rome (the Lateran Baptistery has one as well). The frescoes in the chapel are the work of Antonio Tempesta (1555-1630). In the picture included in this post (see above), we see the torture and execution of Felicianus on the left and that of Primus on the right. Close-up of the apse mosaic. The Sufferings of the Martyrs. 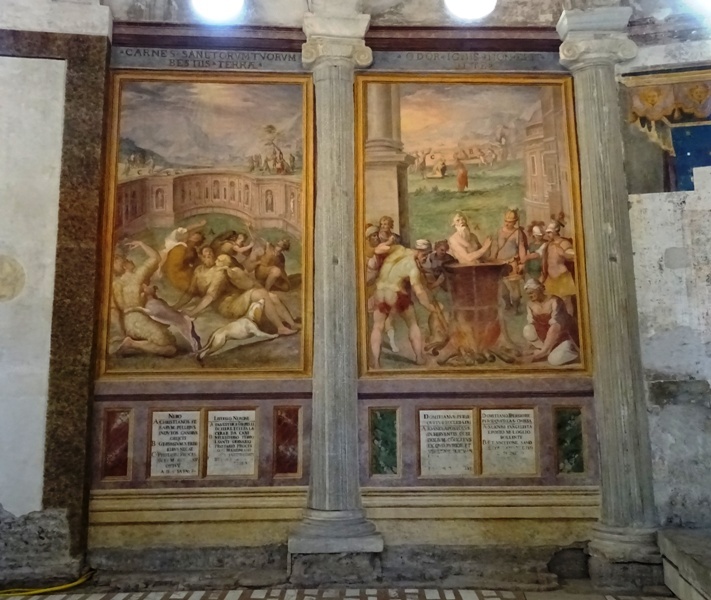 The Santo Stefano is known for its cycle of frescoes depicting The Sufferings of the Martyrs. These are painted on 34 large rectangular panels and were commissioned by pope Gregorius XIII (1572-1585). They were executed mostly by Niccolò Circignani (ca. 1530-1597) – known as Il Pomarancio – who was aided by Tempesta and perhaps a few others as well. The torture and execution scenes in the frescoes are horrifying, but apparently some visitors are deeply moved by what they see. San Filippo Neri (1515-1595), the Apostle of Rome, took large groups of people to see the frescoes and contemplate on mortality and eternal life. Pope Sixtus V (1585-1590), Gregorius’ successor, was reportedly so moved by the works that he cried his eyes out. Roman parents used to take their children to this church to educate them about the bravery of the martyrs, and so did the Jesuits. On the other hand, art critic Robert Hughes called the church “a kind of Sistine Chapel for sentimental sadists”. Well, I guess it is a bit like The Passion of the Christ. It was a horrible movie with some really disgusting scenes, but for some religious people all the violence and suffering were wonderful. De gustibus non est disputandum. Impression of what the Santo Stefano may have looked like in the 5th century. The first circle of columns surrounds a central altar that is the work of Bernardo Rossellino (1409-1464), the architect responsible for the fifteenth century restoration of the church. Note that the height of the columns is not the same. There is a simple explanation for this: they were pillaged from different ancient buildings. To compensate for the differences in height, the bases on which the columns rest were adjusted accordingly. The outer wall, on which the frescoes are painted, still contains the columns from the second circle, most of which are still visible. There would originally have been a third circle, but it was demolished during Rosselino’s restoration. This reduced the church’s diameter from 66 to 42 meters. See the image on the left to get an idea of the original fifth century building. Between the first and second circle, the visitor can see a rather strange item. It is a gigantic wooden tabernacle carved by one Giovanni (Jan) Gentner, a German master baker who was apparently also quite a skilled wood carver (alternatively, he may have just commissioned it). Gentner donated the tabernacle to the rector of the German-Hungarian College in Rome (Collegium Germanicum et Hungaricum) in 1613. The Santo Stefano Rotondo has been the Hungarian national church since 1778. When pope Pius VI (1775-1799) not so piously destroyed the previous Hungarian national church near Saint Peter’s Basilica to make room for the basilica’s new sacristy, he tried to compensate the Hungarians by declaring the Santo Stefano Rotondo their new national church. A chapel dedicated to King Saint Stephen, the first King of Hungary (1000-1038), was subsequently added to the church. The Santo Stefano has long had problems with damp, which damaged the frescoes. A restoration programme was undertaken and the church was mostly kept closed until 2009. Some older travel guides, like my own guide to Rome, will inform the visitor that the church is closed to the public. Fortunately, this is now no longer the case and visitors can fully enjoy this peculiar yet very interesting building again. Santo Stefano Rotondo on Churches of Rome Wiki. Update 4 February 2018: text and pictures have been updated.